Here's Kanye West in a bunny suit. Sunday was Easter, that most holy of Christian holidays where Jesus rose from the dead and donned a bunny suit. The Kardashian family held an Easter party, and dad Kanye West pulled dad duty by dressing up as the Easter bunny for his kids, North and Saint. 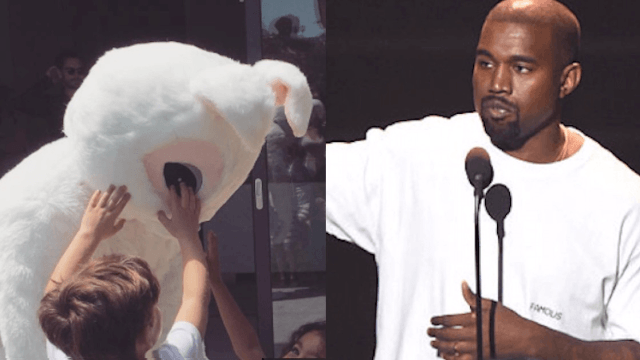 His wife, Kim Kardashian, posted an Instagram of the Kanye in the giant rabbit suit, surrounded by kids, captioned "Dadye." In another Instagram post, Kim Kardashian also became a bunny (at least, I think it's a bunny, but it really could be any animal), but that was only from a Snapchat filter. Another famous dad was at the Kardashian's Easter party—John Legend, the husband of model Chrissy Teigen and father to little Luna Simone. Chrissy Teigen's mom was at the party snapping pictures of the kids and the Easter bunnies, too. Looks like the party was truly hoppin' (ugh, sorry).